Most of what I do at the bench is about “dialing in” rattletrap scooters. Clamps are usually loose, and axles are looser, or- maybe just dead. I see axles that are too long and stacked with washers and spacers, and still loose and rattling. Often the axle is worn out or stripped, and needs to be replaced. Stock axles are easy to strip, sometimes because you used the wrong tool. Always use a metric Allen (hex) tool. Axles are metric. Also - your axles are stripping because you are not inserting the tool all the way into the axle before cranking on it. You need to lean some weight into your Allen tool when you are wrenching your axles. My vote is to get rid of those cheap stock axles that call for 5mm Allen tools. These are the weaker assemblies, and most likely going to strip on you. I witness them breaking while riding them way too often. Look for axles that call for a M8 x 6mm Allen wrench, (www.sctusa.com) and that come with a flat washer and a nylon locking nut. You can tell if the nut is “nylon locking” is when you see the semi clear nylon on one side of the nut. When you run the axle through these nuts, the nylon in the nut presses into the threads of the axle, keeping the nut from loosening on the axle until you loosen it. The combination of the locking nut, and the heavy duty 6mm head on the bolt provide a dependable and very strong axle for better service on your ride. What size axle do I need? 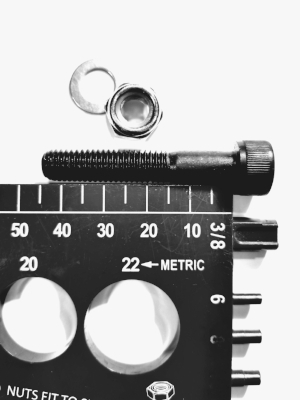 Measure your current axle in millimeters without including the head of the bolt. If that length is 45mm - for example, add 10mm to accommodate the “nylon locking” nut and flat washers (if you use them). So, replace that cruddy 5mm x 45mm axle with a 6mm x M8 that is 55mm axle. As for that “nylon locking” nut, consider replacing it if you are tightening your axle too often. They do start to wear out from the 1st time they are tightened. Usually they are ok for a while though. One more tip about axles. If you are using pegs, make sure you position the head of the bolt inside the peg. This assures the strongest result, and provides for the easiest assembly with good access to the axle nut. So, what should we talk about next? You got questions on wheels? Replacing bearings? Compression? HIC vs IHC? SCS? Ask me and maybe your question is our next issue.